To Cite: Abolhasani Foroughi A, Ostad P, Nazeri M. Brain Computerized Tomography Scan Findings in a Man After Inadvertent Intrathecal Ionic Contrast Agent Injection, Shiraz E-Med J. 2015 ; 16(2):e24377. doi: 10.17795/semj24377. Here is described a serial brain computerized tomography (CT) scan findings in a patient with inadvertent intrathecal injection of Meglumine Diatrizoate 76% for myelography. Intrathecal administration of ionic contrast media may cause severe and lethal neurotoxic reactions owing to their hyperosmolarity. This patient recovered from disease with only minor neurological sequel after 40 days of hospitalization and supportive care. To perform myelography, only non-ionic water soluble contrast agent for intrathecal injection can be used. Here is reported the findings of a serial brain CT scan in a patient with inadvertent intrathecal injection of Meglumine Diatrizoate (an ionic contrast agent not permitted for intrathecal use) for myelography. A 55-year-old man who was a victim of war shell fragment injury and had surgical history of lumbar laminectomy referred with chronic low back pain. He underwent myelography and was unintentionally injected Meglumine Diatrizoate. After a few minutes, he started complaining of severe headache, inability to walk, followed by a decrease in his level of consciousness and myoclonic seizure. His Glascow Coma Scale (GCS) declined to 3 in less than two hours. He was intubated and admitted in the intensive care unit. His initial brain CT scan showed hyperdensity of subarachnoid space consistent with the presence of high density contrast medium as well as diffused white matter hypodensity and increased gray-white matter differentiation compatible with those of cerebral edema Figure 1. After preliminary supportive care a ventricular shunt was introduced to assist faster cerebrospinal fluid turnover. 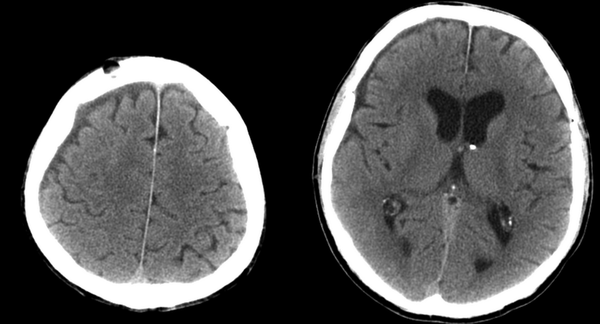 In the second brain CT scan, one day after the event, only the ventriculostomy tube was visible and decrease in brightness of contrast agent in cerebral cortical sulci and decrease in hypodensity of white matter was observed Figure 2. Follow up CT scan after 3 days of continuous medical treatment showed almost complete washout of the contrast medium from subarachnoid space. Although to a lesser extent, white matter hypodensity consistent with cerebral edema still persisted. 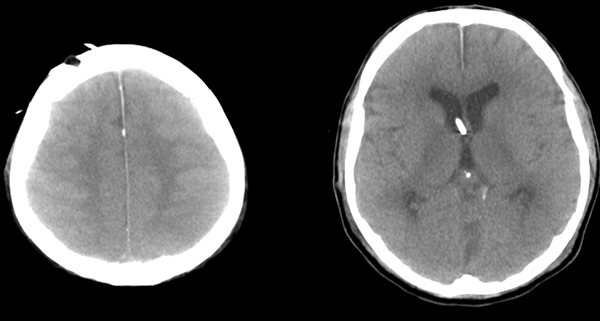 The patient’s GCS was calculated to be 10 at the time of this follow up CT scan, Figure 3. After 10 days of hospitalization and supportive care, the patient regained full consciousness showing GCS of 15 and only complained of difficulty in walking. 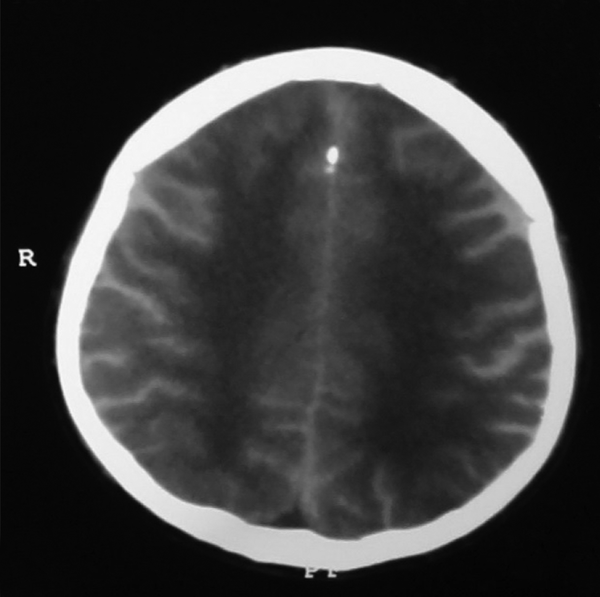 CT scan at the time of discharge demonstrated complete resolution of cerebral edema, Figure 4. Meglumine Diatrizoate is an ionic, iodinated and hyperosmolar X-ray contrast agent. Ionic hyperosmolar contrast media must never be used for intrathecal injection because of the risk of central nervous system toxicity and functional alterations (1, 2). The lethal dose of intravenous Sodium Diatrizoate is 1400 times lower than the same medium administered via intrathecal route. Application of ionic contrast media to neuronal tissue induces impulsive ventral root activity causing muscle spasms and myoclonus, likely as a result of a decrease in inhibitory mechanisms of synapses. Besides, these agents may produce brain edema. Mild white matter hypodensity due to cerebral edema is still noticeable. 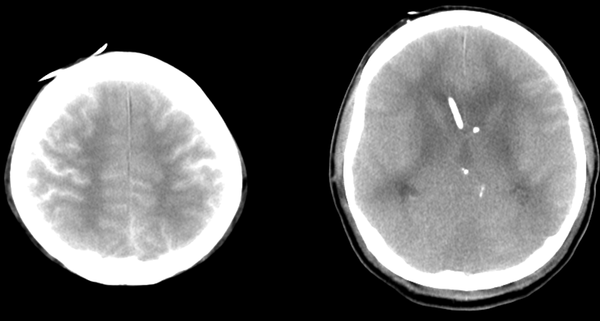 The patient’s GCS was calculated to be 10 at the time of this follow up CT scan.